The DataAmp webcast was packed full of announcements. The Webcast was delivered by Scott Guthrie and Joseph Sirosh. The SQL Server product delivering intelligence, trust and flexibility. 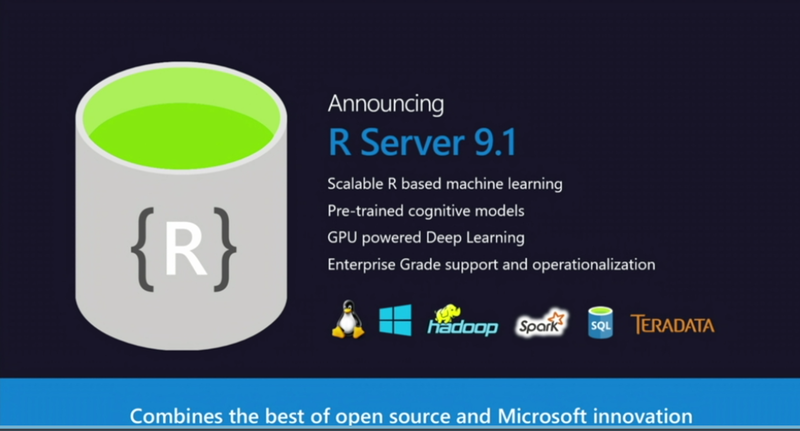 Microsoft confirmed that the next version of SQL Server is SQL Server 2017 and will be available simultaneously on Windows, Linux and Docker. Download the SQL Server 2017 datasheet. It will be the first RDBMS to deliver AI with data. There is a convergence of cloud, data and intelligence. 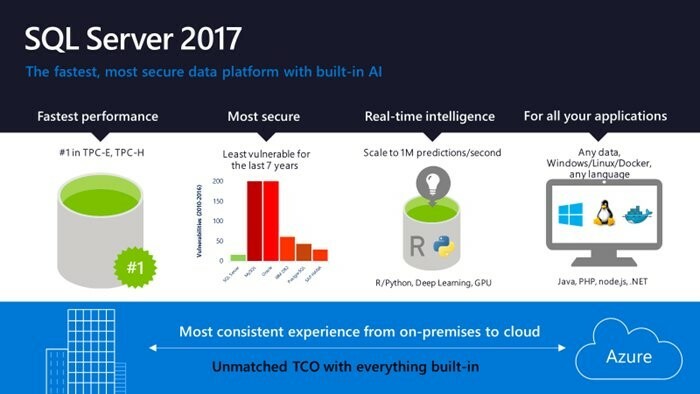 Delivering AI with data: the next generation of Microsoft’s data platform blog shares more information. SQL Server 2017 Community Technology Preview 2.0 now available. There were so many new features announced only a few are mentioned below. There are adaptive query processing improvements which will enhance the performance of workloads. There is a You Tube video SQL Server 2017: Adaptive Query Processing discussing this. Threat detection is now in Azure SQL Database and is straight forward to configure. Hybrid Cloud just got easier to adopt with the new Azure migration resources and tools. To help with SQL Server migrations to the cloud features such as Service Broker, SQLAgent, Profiler etc. are now available in Azure. There is a new data migration service for automatic migration for SQL Server, Oracle and MySQL in Azure . Storing and analyzing graph data relationships. This includes full CRUD support to create nodes and edges and T-SQL query language extensions to provide multi-hop navigation using join-free pattern matching. The SQL Server engine integration enables querying across SQL tables and graph data. The official Microsoft repository for SQL Server in Docker containers is here. SQL Server is the first commercial database to include Deep Learning algorithms, with the announcement of the Microsoft Cognitive Services general availability of the FACE API and Computer Vision API. Azure Data Lake Services now have petabyte scale. Azure Analysis Services became generally available. You Tube video: SQL Server 2017: BI enhancements. 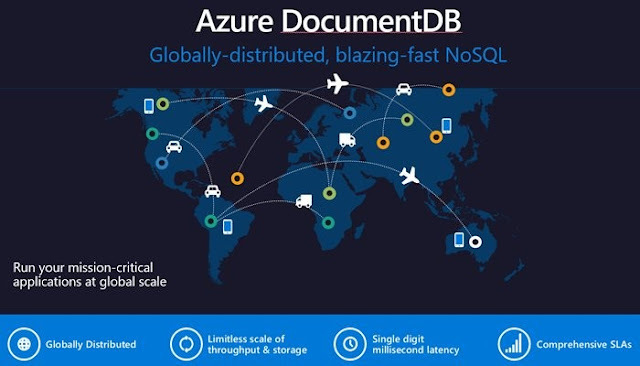 Azure DocumentDB is globally distrubuted and offer limitless scale of throughput and storage. It can be used for things such as IoT applications that need low response times and need to handle massive amounts of reads and writes. You can now quickly build Cortana Intelligence Solutions from preconfigured solutions, reference architectures and design patterns. Some are released with more to follow. 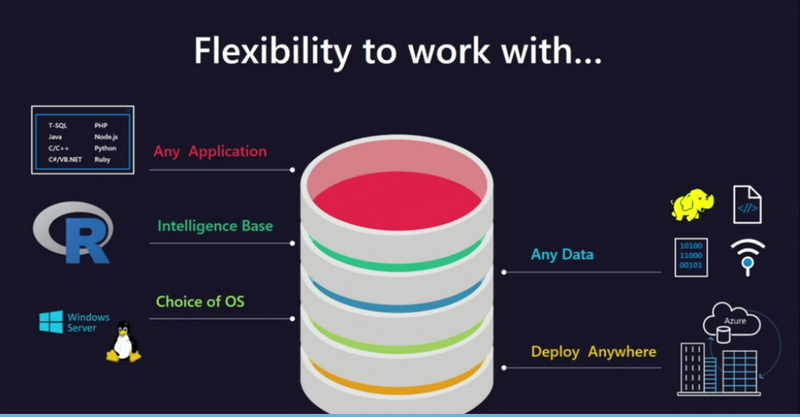 The really important thing that I am excited about is the flexibility of choice within the SQL Server product. Joseph Sirosh concluded comparing the industrial revolution with the intelligence revolution of today.